The family gathering is coming along and you can’t wait for everyone to taste a piece of your grilled or smoked meat.You have really thought of the things you need to unleash your barbecue skills for the benefit of your loved ones one more time. But there is one ingredient that you have probably not paid much attention. And, that’s getting the best lump charcoal possible. You are not alone, however, as many people are unaware of its importance. Lump charcoal is often viewed as a form of fuel. Which is used to get food ready. But, the truth is that the best lump charcoal is as much an ingredient as the other products you have lined up. If you think about the flavor and aroma it gives the food, then you will certainly agree with the sentiment. The end result of your food partly depends on the fuel you use in cooking. The smoky flavor and aroma of your grilled are largely affected. Hence, why you must be careful in your selection to ensure that you get the best lump charcoal. Choosing the best lump charcoal is not exactly easy, especially with tons of different types out there. It can be even more confusing when every manufacturer claims to have the best lump charcoal brand around. Hence, why we have written this guide to aid you in your search for the right brand and variety for your needs. 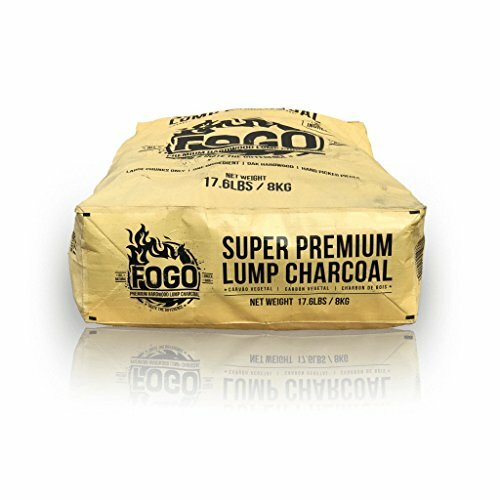 We have also listed some of the best lump charcoal brands that you should easily find near you. Charcoal can be loosely defined as a solid mass of carbon. Which, has no definite shape and black in color. It looks like charred wood at first glance. Because it is made from natural hardwoods. Most manufacturers source the raw materials from sawmills. They collect the waste wood pieces that saw millers throw away. Furthermore, short logs and tree limbs are other sources of the raw material. Charcoal has been around for centuries; It is used for making gunpowder. Other industries such as the cosmetic and carbon filter industries use it to create their products. The process of making it requires a lot of physical labor and wood. To get just a quarter ton, you would need approximately one and a half tons of wood! A considerable amount of time is also needed in the process. This is because it takes days to complete. The wood is burned in an environment with a restricted flow of oxygen. If you want a small scale production, a kiln will be enough. But if you are looking at going commercial, then large concrete silos are what you need. You can reach the purification of the wood without letting it reach the ash stage. This is because the heat combined with the oxygen-free environment removes the oils, volatile alcohol, water, and other compounds from the wood. What is left after these toxins burn away is called lump charcoal. No chemicals, fillers, or additives are involved in its production. This minimizes smoke and eliminates harmful fumes when it is lit. The only emissions that you get when you light it are carbon monoxide and water vapor. Lump charcoal gives a natural burning fire that lasts longer and burns hotter than wood. It gives your grilled food a natural taste, the reason most grill masters prefer this form of fuel over other briquettes and the like. There are many forms of fuel in the market that can be used for smoking and grilling. Are you wondering why you should prioritize this one over the others? The following are a few advantages of choosing charcoal for your barbecue or restaurant. This fuel type is made purely of hardwood. This ensures that it has no strange smells or odors that can probably be transferred to your food. Compared to briquettes, it lights up in just a few minutes. This particularly advantageous if you are in a hurry to get that barbecue ready. It can produce temperatures as high as 650 degrees Celsius because it reacts easily with oxygen. This makes it ideal for fast cooking but can also be regulated for slower cooking. The chunks burn longer, which means that you use few pieces for cooking saving you a great deal of money. The 100% pure hardwood burns naturally with a pure flame for that natural smoky taste and flavor. Compared to other fuels, it produces less smoke and leaves little ash. This ensures that your food doesn’t get an intensely smoky taste and smell. The lack of ash makes your cleaning much easier after use. Another advantage is the fact that it is an affordable source of cooking energy. Compared to briquettes, it actually costs half the price! At this point, you might be convinced that lump charcoal is the ideal source of fuel for you. The question that is probably lingering in your mind is how to tell if it’s of good quality. It should be made from pure hardwood. Check the packaging to ensure that there are no chemicals and additives used in the manufacturing process. The best lump charcoal should come in large pieces to ensure a longer burn. You should pay close attention to the packaging to ensure that it has medium to large sized pieces. Just look for shapes that look like chunk wood or branch pieces. If they appear to be broken, then the bag will have more small pieces. A good package should have less dust. The good thing about dust is that it tends to go to the bottom of the bag. By just touching the bottom of the bag, you should be able to tell the amount of dust in the bag. It should be free of foreign substances such as stones and nails. Most manufacturers source for raw materials in furniture shops and sawmills. This means that the wood will sometimes have nails that can find their way in the bag. Check the description in the bag to ensure that it has been hand-selected. If the product has not been properly produced, it will have chunks of wood that are not completely burned. These are likely to produce sparks when lit and can be very dangerous especially with kids running around. Sometimes you may find that the best hardwood lump charcoal is not available in your area. This will, of course, leave you with no choice than to order online. Just go through the reviews and ensure that you go for the brand that guarantees good quality. Before you place that order, be sure to know whether they refund money or replace the bag if the quality turns out to be bad for you. After looking for the above characteristics, you probably think that you are good to go to find the best lump charcoal. But, before you make that purchase, there are several other things that you should consider. The following are the most commonly used wood and the flavor they promise. This hardwood has a slightly sweet taste with a little intense fruity flavor. This makes it ideal for foods like pork, beef, poultry, game birds and fish. Just like apple hardwood, this wood gives a fruity and sweet taste. It is therefore suitable for all types of meat including chicken and duck as well as salmon. This wood is readily available in South America. Unlike the earlier discussed woods, this wood gives a bacon-like flavor with a strong smoky taste. It can be used for all types of meat but it is most suited for pork. Oak hardwood has no aftertaste and the smoky flavor is mild. This makes it ideal for all types of meat. The red oak is particularly good for ribs. Acacia belongs to the same class as mesquite. It gives a sweet and piney flavor but it is not as intense as that of the mesquite. This makes it blend well with dark meats such as lamb, goose and duck. It is also ideal for most vegetables. This wood adds a subtle taste that is mildly sweet and smoky. These tastes blend in well with vegetables and meats such as pork, game birds, poultry as well as cheese. This hardwood gives the meat a mild sweet taste. It is well known for smoking salmon in the Pacific Northwest. It is suitable for light meat such as poultry, game birds, fish and pork. Just like there are woods that give the best hardwood lump charcoal for grilling and smoking, there are others that are avoided. Spruce, pine, and other evergreen woods emit tar and resins. A wood like cottonwood is best used for fuel but not for smoking. It also has to be mixed with other woods even for fuel purposes. Butternut has a strong smoke and although it has a walnut taste, it is bitter when used alone. Just like flavors, different types of woods burn at different temperatures. In addition, different food cooks at different temperatures. For instance, apple burns at 643 degrees Celsius, cherry burns at 592 degrees Celsius, and maple burns at 648 degrees Celsius. This means that you should consider the temperature that is ideal for the type of foods you plan to make. Most packages indicate this information, so you do not have to worry about memorizing all this. Caring for the environment is probably the last thing on your mind when purchasing fuel for burning. But it is very important especially with the global warming debate going on. There are manufacturers who cut down trees in such a way that it destroys the rainforests. On the other hand, there are those who choose sustainable methods such as wood scraps from sawmills. You should always opt to care for the environment. Eco-friendly varieties are easily available, especially in the United States. The abundance of varieties available in the market might make you feel confused. The above tips should point you to the right bag. However, there are few things that you should also completely avoid if you want to have the best results with your cooking. There are brands that are infused with artificial flavors during manufacturing. One characteristic of charcoal is that it is very absorbent of smells. This means that it could have absorbed a higher level of these artificial flavors than necessary. This will without a doubt be transferred to your meal. It can even change your dish in a way that it is rendered inedible. Manufacturers know that some people find it hard to ignite this form of fuel. Some have adapted the technique of adding petroleum-based products to make it self-lighting. It sounds enticing especially if you belong to the group that takes hours to light your grill. These products affect the taste of the food negatively and you should steer clear of them. To have a good judgment on the quality, you will need to use a brand several times before ruling it out. That is if it does not lead to extremely bad results on the first trial. Sometimes you may not have the patience to carry out subsequent trials because it can be very frustrating. I have compiled a list of the most popular brands to save you the trouble. The following products are preferred by a large group of barbecue enthusiasts and pitmasters. You will, without a doubt, find something that will fit your preference for best lump charcoal. Fogo is a Portuguese word that means fire. Just as the name depicts, hot fire that burns for long is what you get from this brand. Getting the fire started is very simple— in just fifteen minutes, you should be grilling. All you need is a chimney starter or a kitchen paper towel soaked in vegetable oil. Just put it underneath a pile of charcoal and light it. However, using lighter fluid is not encouraged by the manufacturer. With this product, you do not have to worry about sparkles flying to you. Additionally, the smoke is very minimal. Using this gives your food a more natural taste. This is because it is made from Oak hardwood that is sourced from Central America with no other additives. It gives a natural clean fire that burns your meat perfectly while locking in the best flavors. For this alone it is already considered one of the best lump charcoal options available. It is also hand-selected so expect each bag to contain a bigger percentage of large chunks that you sometimes have to use a hammer to break. The large chunks are advantageous since you only need a handful to get the fire started. They are also ideal for any type of smoker and grill such as Kamado Style Cookers. This brand is ideal for all types of food including vegetables, fish, and meat. This is because it can be used for both fast and slow cooking. You can choose to go for an indirect approach, for instance, use a salmon filet on a cedar plank or just cook your food directly on the chunks. All you need is to regulate the temperature of your cooker using the air vents. The price of is also reasonable for both restaurant and home use. The manufacturers of this product have clearly paid close attention to the content of the bag. It is made from South American Quebracho Blanco hardwood. Furthermore, it is 100 percent natural with no additives or chemicals. As the name suggests, this has been specifically designed to give you a fire that burns hotter and longer than the devil’s fire. You also get a natural flavor for your food. The bag contains large dense to medium chunks that are hand-picked and hand-cut. The dust and small chunks are very minimal which gives you a better value for your money. The packaging is similarly superb. Furthermore, It comes in a Kraft paper bag that is heavy duty to avoid breakage during transportation. It also reduces the mess created by the dust in your kitchen or backyard. This product leaves minimal ash residue which should make the cleaning process easier. This is a plus since you don’t have to worry about clogging your cooker as you prepare your food. Smoke becomes a thing of the past and sparks are something you do not have to worry about. With just a few pieces of paper and a match, you are able to achieve this burning so there is no need for lighter fluid. It is perfect for any type of smokers and grills. 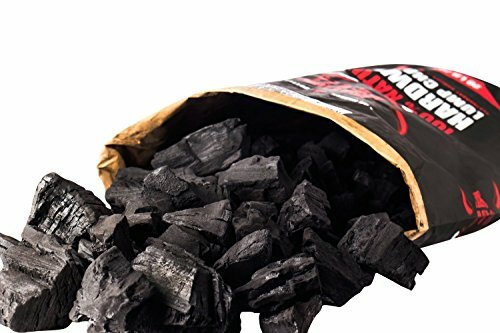 This is a great source of fuel for your backyard barbecues or your restaurant and definitely one of the best lump charcoal options on the market. If there is a brand that promises to give your food a sweet, fruity and smoky flavor, then this is it. Each bag contains high-quality products that are a clever mix of apple, cherry, and oak hardwoods that are sourced all the way from Ukraine. They give a pure burn that is free from chemicals, gasoline, and other smells. It works very well when it comes to locking in the flavors while bringing out your grilling mastery. This product lights up pretty quick, in just five minutes you will already have it ready with just a sheet and a half pieces of paper. The fire goes up to about 602 degrees Celsius and burns for a considerable amount of time. The best thing about it is that it has no sparks or smoke. The fuel burns effectively leaving very little ash residue. Cleaning your stove, grill, or pit after use also becomes very easy. This brand is very good for different types of wood including pork, game birds, meat, and poultry. It also goes well with all types of grills and it is popular among pitmasters. It cooks really fast but that does not mean that you can’t use it for slower cooking. Regulating the air vents should give your desired temperature. Getting the pieces to light can be a highly daunting task for many people. Both seasoned and new users sometimes take hours in what is supposed to be a few minutes’ work. It can be very frustrating especially with family and visitors waiting for that barbecue. But, you do not have to worry, there are starters in the market designed to help you get the chunks burning in no time. We have chosen one brand that is popular among users that will ensure you use less effort and time to get your pit, smoker or grill going. This starter is made from 100 percent natural elements of recycled newsprint, wood chips, and pure paraffin. It has no chemicals or other substances added which makes the chunks remain odorless. This means that it will not have any effect on the taste or smell of your food. The product burns fast, evenly, and for about 10 minutes long. Just a single square is enough to get your lump charcoal burning. It is ideal to start a fire in all types of grills and barbecue smokers. The packaging comes in bricks form that is broken into several starter squares. To get the burning underway, just place a square in position in your grill, smoker, or pit and use a match to light the rough edge. Most people opt for lighter fluids but they create a greasy mess in your kitchen. The advantage of using this device is that it creates no mess and has no smoke or smell. You now have the proper pieces of equipment to get a fire going. You must be wondering how you can go about creating that fire on the grill or smoker. The following procedures will guide you on how to effortlessly get that much-needed fire. Put the starter in the chimney. Carefully place pieces of on top of it. Be sure to leave air spaces between the chunks. This is because fire needs oxygen to burn. If a piece is big to fit in the chimney, just break it down with a hammer. Using a match or lighter, light the rough edges. The fire should spread evenly and have the pieces burning in no time. After the chunks are evenly burned, carefully transfer them onto your pit or grill. You have to use a heat-resistant material to avoid burning. Add more pieces to get the amount of fire that you need to get your cooking done. Most brands will result in some sparks. It is wise to let the chunks burn until all sparks are gone before placing your food. To ensure that they do not pop into your food. Since bags come in different sizes, it is good to group them accordingly. This way, you will be able to use the large chunks for heavy cooking such as roasting big chunks of meat. You can utilize the small chunks for lighter cooking such as grilling hot dogs and burgers. The downside of using both the large and small pieces together is that you might get an uneven burn. Nothing beats the smoky taste of a chunk of meat that has been cooked over a pit. 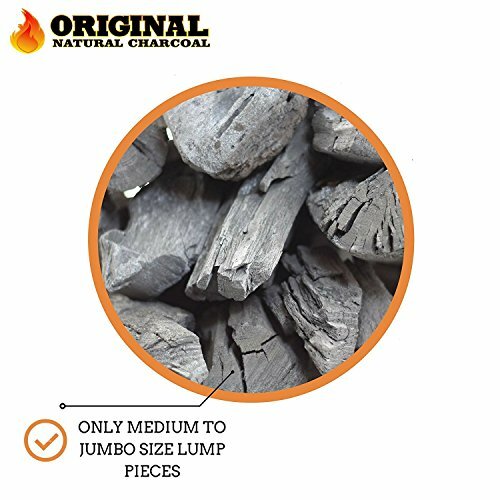 If you follow the above guidelines, you will be able to select the best lump charcoal for smoking. Cooking with this source of fuel is actually an easy process. If you follow the following steps, you will have a yummy end result. Smoking with lump charcoal usually takes longer and requires low temperatures. This means that you will need to keep the fire burning for long while maintaining temperatures at a low level. This calls for a clever craft in arranging the chunks. One way to achieve this is arranging the lit pieces at the sides of the grill. Ensure that you leave an empty space at the center of the grill. This empty space will be taken by a foil pan that you will fill with water. The purpose of the water is to regulate the temperature while adding some moisture to the grill. Another method that is popularly used is called the snake pattern. This involves arranging the unlit pieces around the grill in a manner that resembles a snake. Do not forget to leave an empty space at the center. This space will help temperature and moisture regulation. Get lit chunks and place a heap where the snake ends. The fire will move slowly and for long around the snake. You can also use the burn down method. This process involves filling the grill with unlit pieces. The lit ones are then placed at the top of the unlit ones. This means that the fire will start burning downwards towards the unlit coals at a slow pace and at a low temperature. When smoking with this form of fuel, ensure that the temperature stays between 107 degrees Celsius and 121 degrees Celsius. You can use a meat thermometer for monitoring. An effective way to ensure that the device accurately measures the temperature of the air inside the grill is by placing it at the top vent. This will ensure that it hangs downwards. If the temperature leaves the recommended bracket, use the vents to control it. If you close the vents, oxygen getting in will be reduced which will, in turn, reduce the heat. On the other hand, the reverse will happen when you open it. Some types of meat such as brisket and ribs take longer to cook. This means that you need to have the fire going for longer. There will be a point that will require you to add more fuel to complete your cooking. The amount you need to add will depend on the temperature of your grill. If it is lower than required, you should add lit pieces to raise the temperature. When the temperature is high, add unlit ones so that they burn gradually and reduce the temperature. If you choose the best lump charcoal for smoking, it should take a considerable amount of time before adding more coals. The most tempting thing when smoking meat is lifting the lid to check the meat. This act has a negative effect on the process. It will give way for smoke and heat to escape which will swing the temperature levels. It can also end up making the chunks burn at a rapid rate or burn the meat. You should restrict the times you peek for temperature checks and fuel addition only. It is important to note that there are grills that come with an inbuilt water tank in the market. Unlike smoking, grilling is a fast method of cooking and often requires higher temperatures. The food should be equally good and appetizing. With the best lump charcoal for grilling, you should be finished with the process within no time. Follow the following steps for best results. With the guide discussed above, start the fire in a chimney. Be sure to use more pieces for hotter temperatures. Spread the lit chunks evenly while leaving small empty areas for cooling purposes. Ensure you use a spatula or tongs to avoid burning your hands. Give your grill time to reach the recommended temperature for grilling. This is between 232 degrees Celsius and 287 degrees Celsius. You can use a thermometer to check when it achieves the right temperature. The next thing to do would be to start cooking! When deciding on the method of cooking, every person hopes to get the food done without having to deal with minor or major accidents. We also desire to leave create a minimal amount of mess for easier cleaning. Smoking and grilling with the best lump charcoal has become a favorite way of cooking for many people for this very reason. But just like any other fire, it poses some dangers to your life if not handled with care. The following precautions should ensure that you and your loved ones remain safe during the whole process. Lump charcoal emits carbon monoxide when combusted. As we all know, human beings breathe in oxygen. Carbon monoxide can be harmful to the human body. It is advisable to ensure that you place your grill or smoker in an airy environment especially when cooking indoors. You can open the door and windows to let in enough air. Smoke can be harmful to the eyes especially when exposed for a long period of time. Ensure that when lighting your grill, you give it time so that the smoke is totally out before you start using it. Ensure that you keep an adequate distance from it as you wait. You should also ensure that the brand you buy is smoke-free. With the above guide, you should be able to get the best lump charcoal for grilling and smoking that will have no smoke. Handling charcoal creates a black mess that sticks to hands, clothes, and the floor. The process involved in getting the dirt out is quite a difficult task so make sure that you use protective clothing. For instance, you can use an apron with darker colors and an easy-to-clean fabric. Put newspapers or pieces of clothing on the floor to protect it from dust and staining. It is also advisable to wear gloves to keep your hands free from dirt and scratches. Handling the charcoal with bare hands can also cause bruises. Some bags come with foreign substances such as nails, metal, and stones. The gloves will protect your hands from cuts that these substances can cause. The truth is that you will be unable to finish a whole bag in a single use. The best thing about using the best lump charcoal possible is that it has no expiry date. You can use it for years to come as long as you observe proper storage procedures. The following tips will help you store your lump charcoal for future use. Humidity and moisture are its worst enemies. The pieces are porous, not unlike a sponge. Once exposed to water, it will soak up the fluid and become wet. Getting wet chunks to burn is extremely arduous since it can only burn after all moisture is dried up. Besides that, it burns unevenly and produces a lot of smoke that can affect the taste and aroma of the food. However, all is not lost if your charcoal gets wet. You can always take it out to dry, but take note that this process will take quite some time. However, you might need to run back to shop for a drier bag if you are in a hurry to use it. Instead of going through this treacherous process, just make sure that you store the leftovers in a dry place. You should also ensure that the bag is airtight to keep humidity at bay. If you can’t find an airtight bag, you can opt for sealed plastic containers or a pail with a tight lid. Metal trash cans also provide a good storage choice. As seen above, there is a lot to say about lump charcoal for smoking. We hope that this guide has been useful in teaching most of the things you need to know about it. If you follow the tips and keep the aforementioned factors in mind, you will easily find the best lump charcoal in the market. It should go a long way in saving you some money. 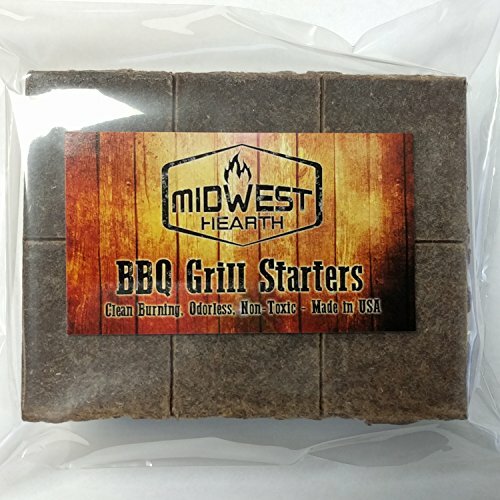 If you have less time to test what is available near you, the above reviews should be a good place to begin in finding the best lump charcoal for your situation. You now understand that different woods give off certain flavors and aromas. Be sure to familiarize yourself with specific woods for varied tastes. This guide also reminds you to be as kind to the environment as possible, so make sure that you keep that factor in mind. With the storage tips above, you should be able to use every single chunk inside the best lump charcoal bag you get. The safety precautions will ensure that you stay safe and clean as you prepare that delicious barbecue. The best lump charcoal is meant to give you naturally tasting food with a natural flavor in a safe and secure manner. With this guide, you will be a master in lighting your grill in just a few minutes. You do not have to get it right the first time you smoke or grill that meat. But if you follow the outlined procedure above, you should be a pro after a few trials with the best lump charcoal at your disposal.